Grab your tickets for one of the biggest multipurpose venue of Indianapolis! It's a newly built stadium with all the latest material and looks great from the outside and inside. Round about 720 million have been spent to create this awesome piece of architecture. It has a capacity for over 70 thousand people approximately and offers a very good sitting arrangement. It has a retractable roof system that requires 32 cables to operate it. It is designed to guard the stadium's interior from weather conditions and other problems. It is the only retractable roof in the country with two moving panels that meet in a peak above the center of the stadium. It also has a moving window wall that allows additional light. It is actually a huge door made of glass that gives a pretty view while it is open and greater light while it is closed. This saves the audience from suffering any sort of light issues. One way or another, the stadium is always glowing. The famous architecture company, HKS, Inc. has given the stadium a retro and a much-modified look, which makes it very classy and innovative. Years were spent to make this fine piece and now it's finally done and hosting rocking concerts and sporting events like anything. Thousands of people can be easily housed together in a jiffy. The seats are comfortable with ample leg space Some of the annual events of the stadium are DCI World Championships, Circle City Classic and IHSAA Indiana State football Championships. Some of the other notable events are NCAA Men's Basketball Regional Finals and NCAA Men's Basketball Final Four. For the ease of all the sports lovers, the stadium has two massive Daktronics high definition scoreboards situated in both the corners of the stadium. This makes it easier for thousands of people to see the scoreboard. Attending your favorite event is more than a dream come true when it's in the Lucas Oil Stadium. The revolving lights along with other high tech facilities make a concert look way better than at other venues. They've got it all! Right now many sports related events are up on the list that include the Big Ten Football Championship Game, Super Bowl XLVI, NCAA Men's Basketball Final Four and NCAA Women's Basketball Final Four. Whatever event you choose to attend here, entertainment would be guaranteed! It's going to be awesomely outstanding, so don't forget to bring along your friends. Capture the golden moments of your lives. This stadium has had some very historical events of international standing. People fly all the way from other states just to attend such events here. Besides that, the stadium's restaurants provide a variety of food items that'll suit everybody's taste buds for sure. Have a delicious meal or a snack and enjoy the show. Reserve your Lucas Oil Stadium Tickets and have loads of fun! The average Lucas Oil Stadium Tickets price will cost you between $54 and $1366, if you are looking for the cheapest seats then catch the event being held at the Lucas Oil Stadium, Indianapolis on 26/03/2020. The average ticket will cost you the highest on 21/09/2019 at the Lucas Oil Stadium, Indianapolis. Minimum get in price is for Lucas Oil Stadium Tickets is $16 for the event being held at the Lucas Oil Stadium, Indianapolis on 01/05/2019 , there are some venues that have a much higher get in price, for instance the cheapest seats at the Lucas Oil Stadium, Indianapolis on 21/09/2019 will set you back $908. Me and my mate has planned to go to this coming event as our get together, since were both students well be needing cheap afc championship game indianapolis colts tickets. Where can I find the best 12 colts vs patriots tickets? Buy premiere tickets to Lucas Oil Stadium only from the worlds best ticket network proudly known as Ticket Luck! I will be needing colts jets tickets jan 24? Check out our Lucas Oil Stadium page and know instantly about the Indianapolis Colts and New York Jets game! Do you know if afc divisional playoffs indianapolis colts tickets are avaialble? Indianapolis Colts AFC Divisional Playoff tickets are up for sale, Have a look at them now! 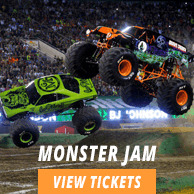 Do you have monster jam indianapolis 2019 ticketmaster tickets? Lucas Oil Stadium Tickets are very much available with us so grab them now! HI! Would you have the afc championship game new york jets tickets on you? We have a huge inventory of AFC tickets! Check it out NOW!